This is a guest review by Don Schlaich, you can check out more of his work on his website. Synopsis: THIS IS THE WAY THE WORLD ENDS... FOR THE LAST TIME. 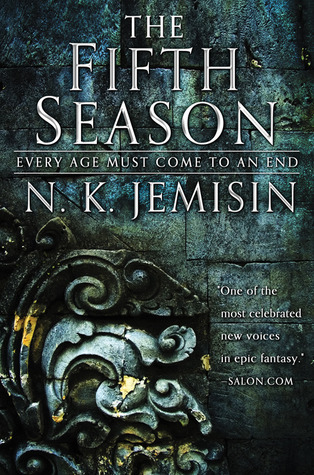 About the Author: N. K. Jemisin is an author living and writing in Brooklyn, NY. This is fortunate as she enjoys subways, tiny apartments, and long walks through city parks. Her short fiction has been published in a number of magazines and podcast markets, and has been nominated for the Hugo and Nebula award. Her novels have also been nominated for (collectively) the Hugo, the Nebula, the Tiptree, the Crawford, the Gemmell, and many more. Review: The Fifth Season is an enjoyable and engaging read that takes you along the track of three people's lives, the story of one woman who wields powerful magic in a world where that magic is seen by most as a curse. There are brutal aspects to this narrative, the very nature of viewing the world from the point of view of the oppressed; the very ways in which the society attempts to dehumanize the Orogenes, people gifted (cursed) with the ability to move rock, lets you see their humanity under pressure. In many ways, the divided nature of the narrative helps you frame the world that the story is taking place in, and it does the work of grounding you in the world of the Stillness strongly. I have been a fan of N.K. Jemison from her Inheritance Trilogy, so I grabbed the first two books of the series without reservations. I would recommend doing the same.